In my attempts to clear through my baking ingredients, before the van goes into storage, I’ve revisited a favourite swiss recipe, rosenkuchen, this week. I discovered this yeasted cake while visiting Lauterbrunnen last winter. 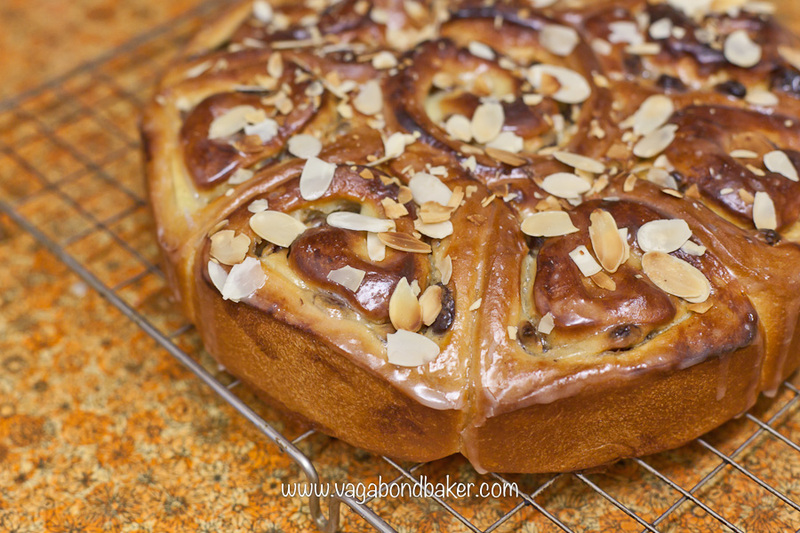 In the original recipe the sweet, heavenly soft bread was filled with chopped nuts which I have replaced with sultanas/raisins and creme patissiere. 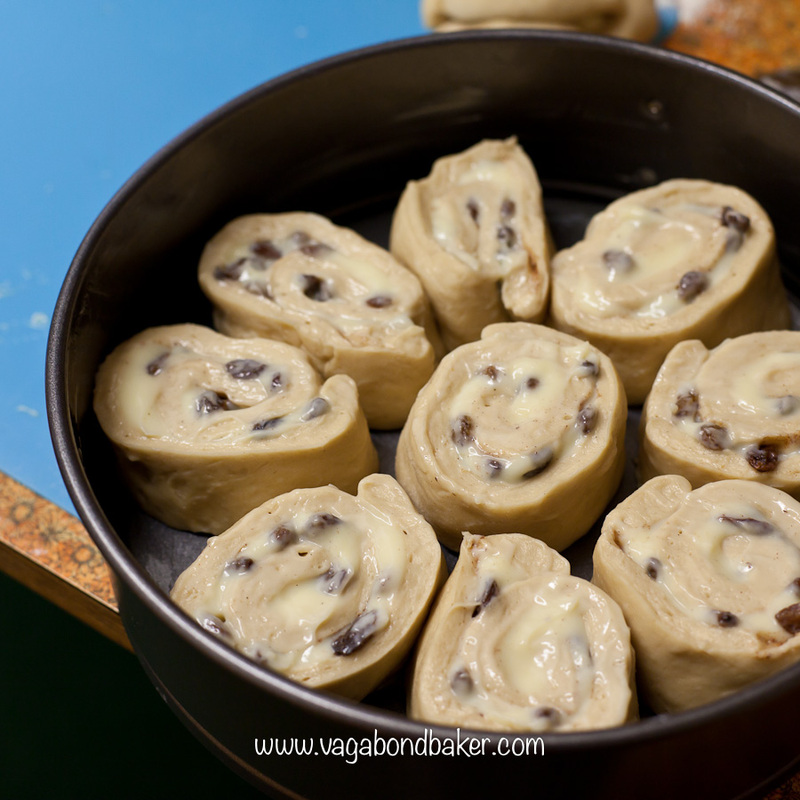 Think of this bake as a Swiss inspired pain aux raisins cake. Most of the creme patissiere bakes into the bread making it wonderfully moist, with a delicious custard flavour. 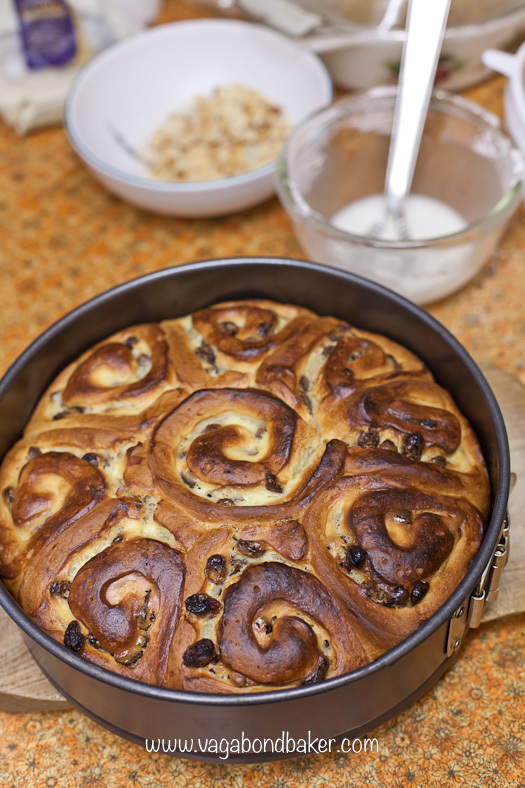 The raisins/sultanas are tossed in cinnamon before adding, and a dusting of nutmeg scent the cake with warming spice. 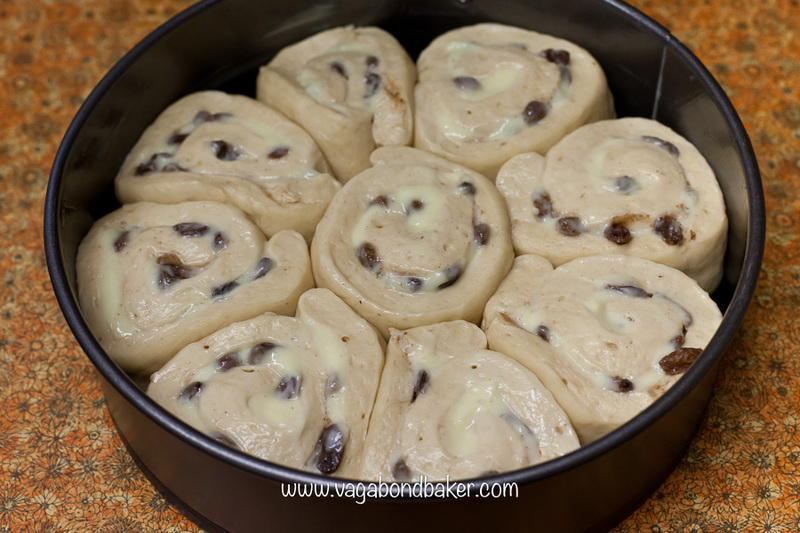 The dough is rolled into swirls and baked in a flower formation, and a sweet glaze and some toasted slivers of almond give an attractive finish. It is perfect to serve with a cup of coffee or tea, or how about a naughty slice for breakfast! 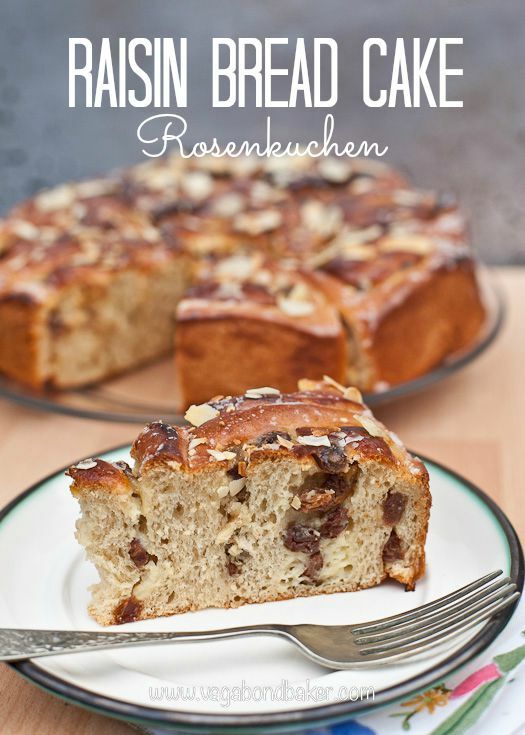 Rosenkuchen is much, much lighter than bread yet it is made in very much the same way. The dough is enriched with butter, egg, sugar and milk and is really easy to bring together. I make it by hand so you really don’t need expensive equipment to bake something impressive. The creme patissiere in also very easy and, dare-I-say, foolproof. a large round cake pan, sides and base buttered and floured. I have also successfully baked it in a Pyrex casserole dish. Combine the flour and salt in a large mixing bowl. Make a well in the centre then scatter the grated butter around the edge. 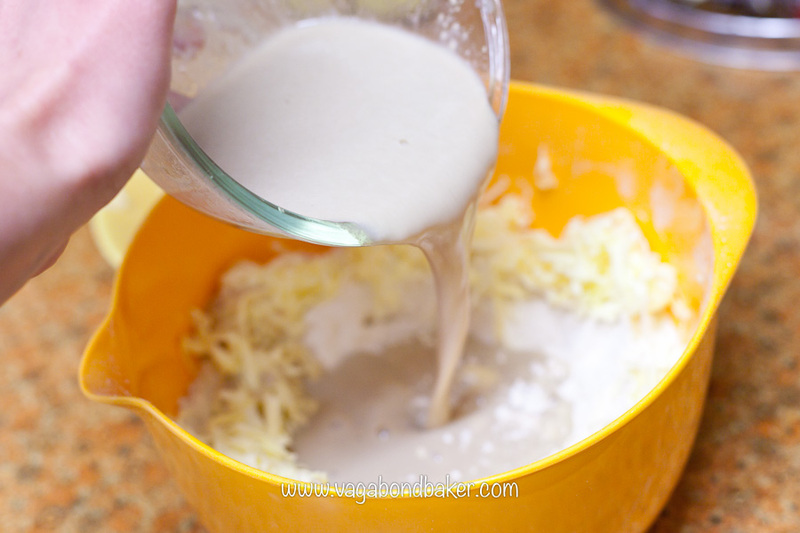 Place the yeast, sugar, egg and milk into another bowl or jug and whisk it briefly to dissolve the yeast and the sugar. You should start to see the odd bubble appear on the surface as the yeast starts working but no need to wait for it to froth up. Now pour this mixture into the well in the flour. 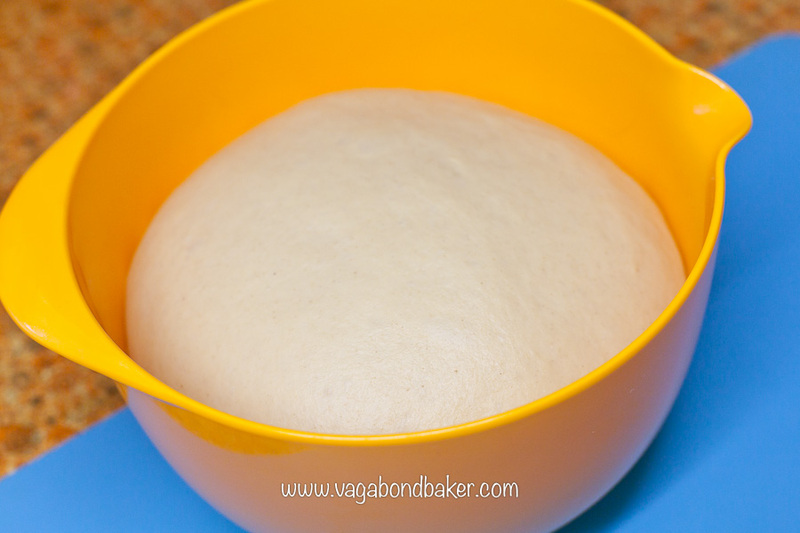 Use a wooden spoon to start to mix in the yeasty milk then switch to your hands to bring it together into a dough. Knead for around 5 – 10 minutes until the dough becomes soft and smooth, adding a bit more flour if the dough won’t come together. Place into a clean, roomy bowl, cover with cling film or a tea towel and leave to prove somewhere warm for about an hour until it has more than doubled in size. 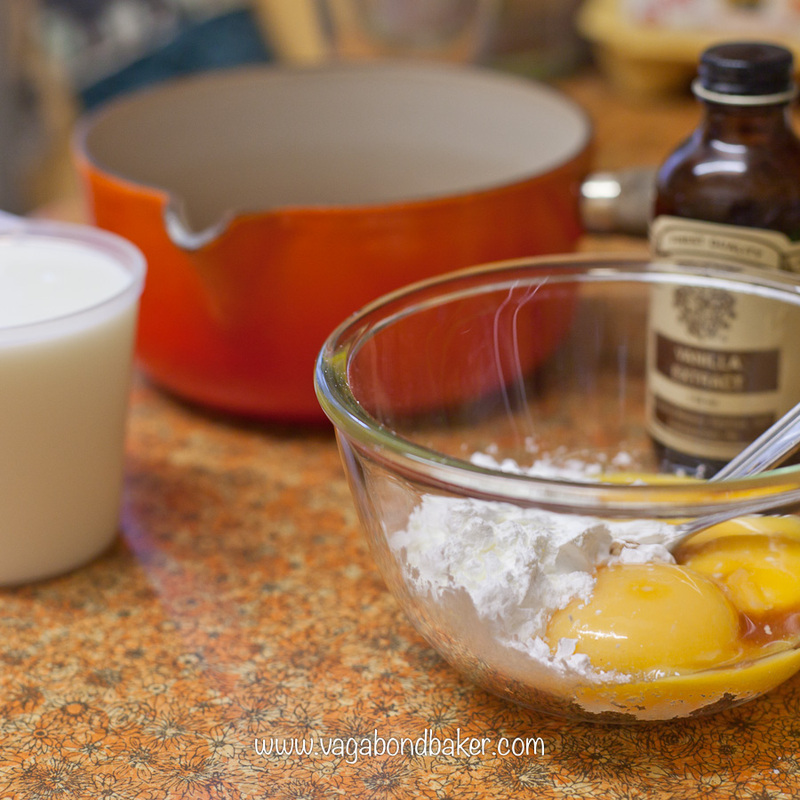 In a bowl, beat the egg yolks, sugar, cornflour and vanilla extract with a whisk until thick. Put the milk into a saucepan and gently bring up to the boil. Once it reaches boiling point, take it off the heat and pour it over the egg yolk mixture and whisk it together. Pour it back into the pan over a medium flame, continually stirring with a wooden spoon until it becomes a very thick custard. Transfer it into a clean bowl and cover with cling film or a disc of parchment touching the surface and leave to cool. If it is left to go very cold it will set, just whisk it to loosen. 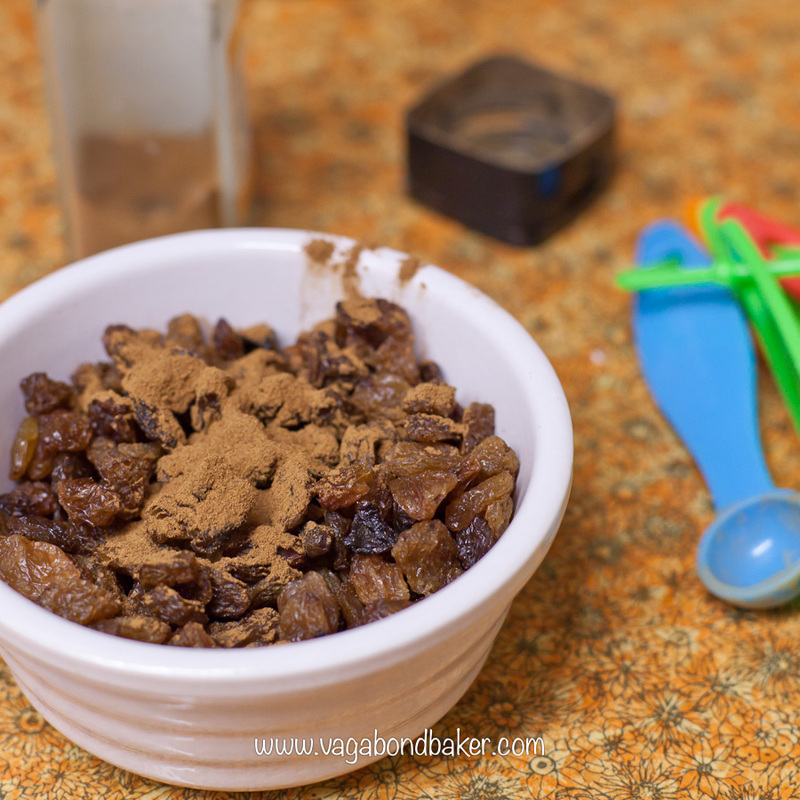 Toss the raisins or sultanas with the cinnamon. Once the dough has risen and doubled in size, knock it back. 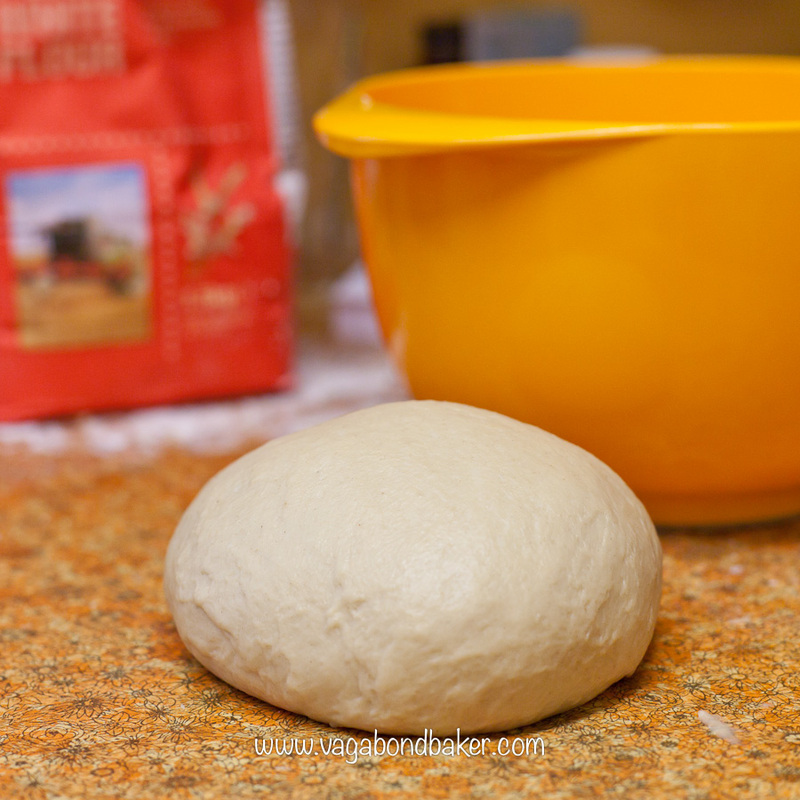 Roll it out with a rolling-pin, on a lightly floured surface, to about a 5 mm thick rectangle. 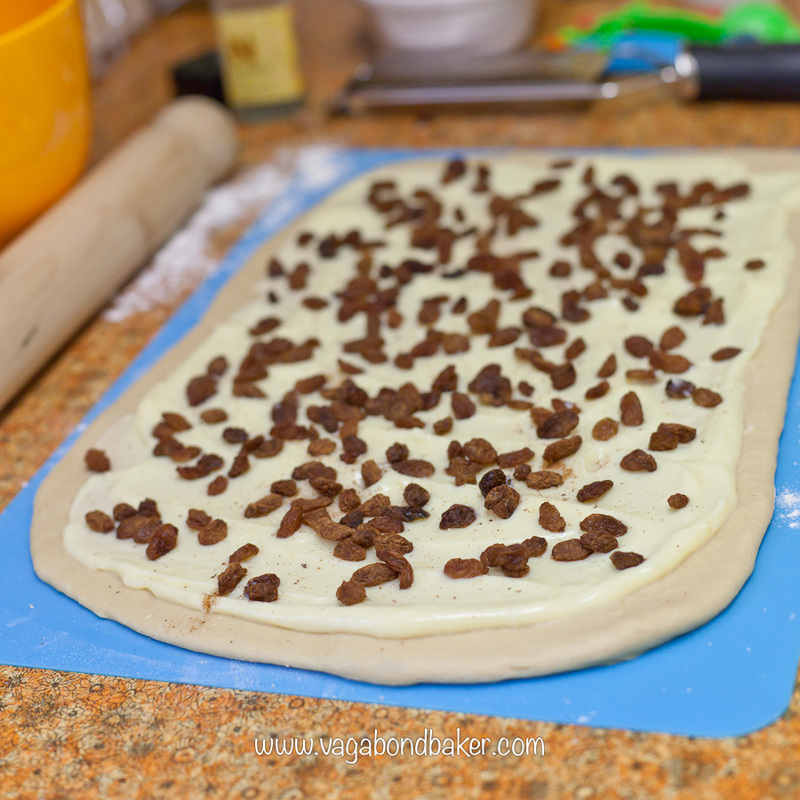 Spread the creme patissiere over the surface of the dough leaving a border around the edge. Give it a light dusting of freshly grated nutmeg then sprinkle over the cinnamon coated raisins/sultanas. Roll up from a long side into a long cylinder, some of the creme patissiere will squish out but don’t worry. Use a sharp knife to cut 4 cm deep pieces, you should look to get 8 or 9 of them. Place one into the centre of your buttered and floured tin or dish, on its side so the spiral is facing uppermost. Evenly position the other pieces around it in a flower shape. Now cover the tin or dish with cling film or a tea towel and leave to prove again for another half hour or so until the pieces are nice and plump. Bake for 40-45 minutes. Keep your eye on it towards the end to prevent it catching and burning on top. Stir the icing sugar and lemon juice together. Once the cake has baked, remove it from the oven, leave to cool for a few minutes in the tin then carefully turn out right-side-up on a wire rack. While it is still warm, brush the glaze over the top of the cake then quickly sprinkle over the flaked almonds so that they stick. Leave to cool on a wire rack before slicing. Store as you would bread, in an airtight container. 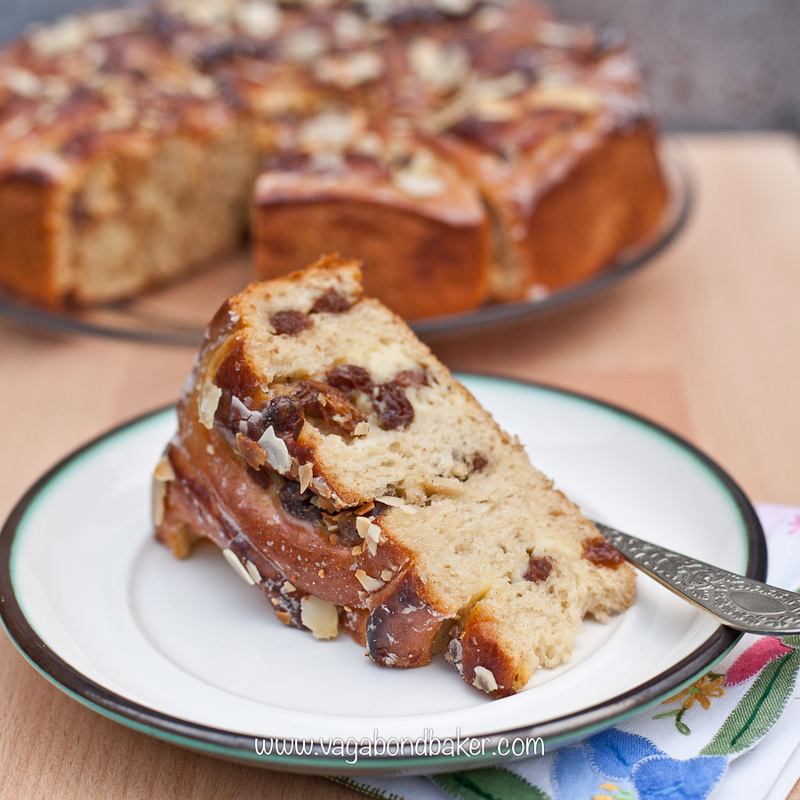 Nutty Rosenkuchen I baked this delicious yeasted cake in a small kitchen in the Swiss Alps! Ticking Off My #1 James Bond Location 007 fun in Lauterbrunnen, Switzerland! Hazelnut Sunken Nutella Cupcakes Need I say more? Lincolnshire Plum Bread A gorgeous fruited loaf from Lincoln. Semlor Swedish Almond Cream Buns a heavenly Nordic Easter bake. 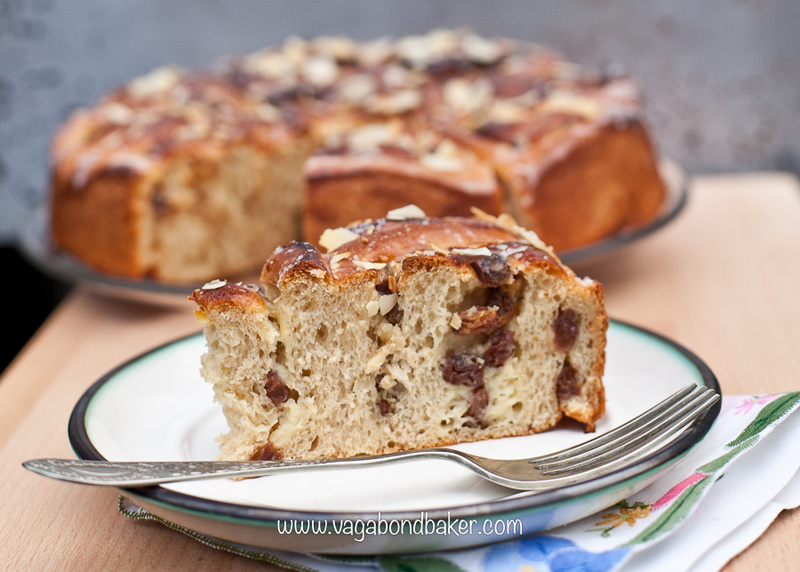 This raisin bread cake looks beautiful! will have to try making it sometime. Thanks for sharing! Thank you, sure does taste good too!